This week at work has been one of the worst I've ever had. Constant fights, tantrums, a lack of doctors, crazy workload.. It's full moon so everyone is going bat crazy! I needed to relax so I decided to take some time out and do a Halloween skittles mani. I'm loving doing different designs on each nail, it's a lot of fun plus I get to try some of my many untrieds! I wish I could spare more time so I could do more full manicures with the designs. I got inspiration for these designs from some of the great blogs I follow! I think my left hand turned out really well but my right hand was pretty much a fail because nothing I wanted actually turned out properly. My middle finger was supposed to be candy corn but my polishes would not cooperate! So I gave up and just used trusty Grape Pop and flakies instead. Thumb: 2 coats of Color Club Wild at Heart with freehanded spider web using Kiss nail art striper in white. Index: 2 coats of Sinful Colors Mint Apple as base, BYS Black Satin for the hair, CM nail art pen and striper in white and black for eyes and Kiss nail art striper in black for the mouth. Middle finger: 2 coats of Essence Undead with Pa witch nail sticker. Ring finger: 2 coats of Sinful Colors Cloud 9 with pumpkin design from Konad plate m13 using Konad special polish in black. Pinky: Rimmel I love lasting finish in Double Decker Red with spider design from Bundle Monster plate BM13 using Konad Princess polish in Black pearl. Pinky: 2 coats of Sinful Colors Big Daddy and 1 coat of BYS Cracked polish in black. Ring finger: 2 coats of of The Face Shop OR202 with bat design from Bundle Monster plate BM13 using Konad Special polish in black. Middle finger: 2 coats of China Glaze Grape Pop and 2 coats of Nubar 2010. Index finger: 1 coat of BYS Black Satin with skull design from Konad plate m13 using China Glaze Devotion. Thumb: 2 coats of Essence Undead, Kiss nail art striper in black for vertical stripes and spider design from Bundle Monster plate BM13 using China Glaze Devotion. WHEW! I'm knackered now. Which design do you like the best? I'll be MIA for the next few days as my exam for my final subject is being released tomorrow so I'll be attempting to steer clear of browsing blogs and the net until it's due on Wednesday. Here's hoping x) Thanks for looking! My Polished Pink for October giveaway ends in 2 days so don't forget to enter here! Aww I love this. And honestly it doesnt look like a skittles mani to me. Maybe I am insane but it seems very cohesive. You did good on keeping the colors grouped together here. Kudos! wow! i can't believe how awesome you are! such time! Favourite is the pinky, for some odd reason. Yours are so much cuter than mine! Haha. And you posted this way early too. Mine will only be up on my blog on Halloween itself. I totally did a skittles for halloween too! Haven't posted it yet though! I love them! Oh my goodness!!!!! This is suuuuuuuuuuuuuuper cute!!! I hope I can find some time to do my nails before Halloween this weekend! I love love love these nails! bahahah your nails are so awesome! only just started having colourful nails and now i aspire for creative nails like yours! Stunning O.O How long did it take you? @Jess: You're making me blush Jess! You are too kind =) I did spend a bit of time on this mani. Time that should have been spent studying! @Shiny! : I got wonderful ideas from the awesome blogs I read. Halloween is great for doing nail art I think! @Samantha: Thank you Samantha! 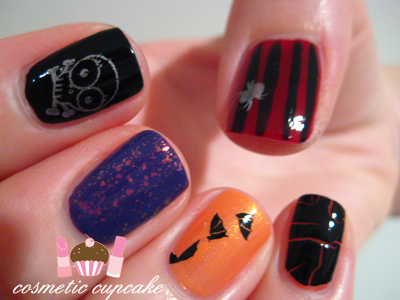 I have to agree with you, Halloween manis are just so much fun to do and look at! @Abby: Your manis are cute, what are you talking about! I look forward to seeing your Halloween mani =) I only posted mine this early because I don't have time in the next few days to do it because of uni. @ipehishere: I'm glad you like it! I think I may wear orange and black even when it's not Halloween, it's a great combo! @Lora: Thanks Lora!! 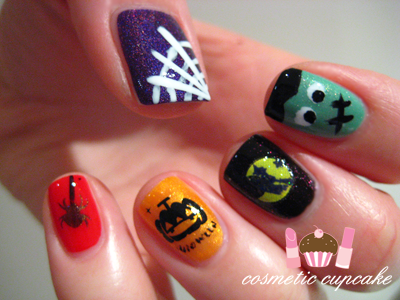 I hope you can find some time this weekend too to do a Halloween mani too! It's SO much fun. @chocolatesuze: Awww thank you so much Susan! All it takes is a little patience and some time. I loved your rainbow nails in your post today! @Nikki: Thank you Nikki! The frankenstein is my favourite too. Next year I'm doing a whole frankenstein mani for sure! @Monika: It took me about an hour and a half..? It wouldn't have taken so long if it hadn't been for my silly middle finger on my right hand! The pumpkin is my 2nd favourite hehe. Orange and black just go so well together! 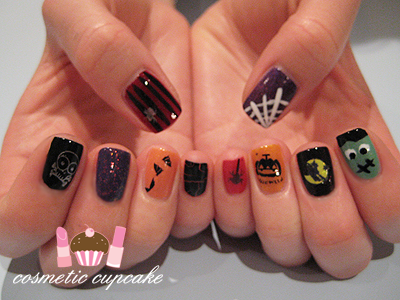 Such a cute Halloween mani with so many elements. Also grape pop + flakies = awesomeness. You are so creative! Your skittles manis always look so well thought out and cohesive. I was just going to do a simple Halloween design (even though we don't really celebrate here in Oz, do we?!) but you've inspired me to try out a mani like this. I think my favourite designs are the spider web, the pumpkin and the frankenstein. This is so freaking awesome 'Chelle. Your designs are so wonderful, creative and cute. <3 you! love this mani, what a great work you did !! I don't have much time to do manis so yeah an hour and a half is long for me! @Terri: Thank you Terri! I'm glad you like them and they weren't very difficult to do either which is great. @Angela: I love the Frankenstein too! And it was loads of fun doing it too! @Alice: Thanks Alice! I can't take credit for all the designs though but they just look so nice together! @Dhini and Lily: Thank you ladies! @Terri: Thank you so much for the award Terri! I appreciate it. @Melanie: You are too kind! Thanks for the sweet comment Melanie. I don't comment often but I really love your blog and this nail art is amazing! So gorgeous! Great job miss! @Emily: I really appreciate you taking the time out to comment on my blog =) Thank you for your sweet comment hun!